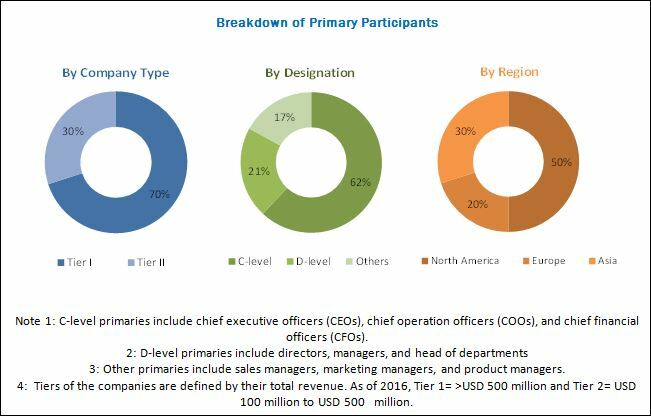 [113 Pages Report] The Parkinson’s disease treatment market was valued at USD 3.99 billion in 2016 and expected to grow at a CAGR of 6.1% from 2017 to 2022 to reach USD 5.69 billion in 2022. The carbidopa/levodopa drug class is projected to register highest CAGR during forecast period. The major driving factors for this market include ageing population and government funding for research, growing healthcare awareness. The base year considered for the study is 2016, and the forecast has been provided for the period between 2018 and 2023. Key players operating in the Parkinson’s disease treatment market include Teva (Israel), Novartis AG (Switzerland), GSK (UK), AbbVie (US), Merck (US), Boehringer Ingelheim (Germany), Impax Laboratories (US), Lundbeck (Denmark), UCB (Belgium), Valeant Pharmaceuticals (Canada), Acadia (US), Sun Pharma (India), Wockhardt (India), Dr. Reddy’s (India), Intas (India), US WorldMeds (US), Zydus Cadila (India), Cipla (India), Strides (India), 1 A Pharma (India), and Upsher-Smith (US). Currently, a wide range of treatments is available for alleviating the symptoms of Parkinson’s disease. Medication is the first line therapy for treating the disease; however, they are not effective in all stages of the disease. In the severe stages, medications do not show pharmacological action in relieving disease symptoms. Neurologists perform thalamotomy, pallidotomy, or implant deep brain stimulation (DBS) devices in order to ease symptoms. Moreover, the focus on gene therapy research has increased. According to the Parkinson's Disease Clinic and Research Center, University of California, US, gene therapy for Parkinson’s disease has shown promising results in phase I studies. Phase II and III studies are currently under progress. Surgical treatments, restriction on the use of medications in severe stages of the disease, and the increased focus on gene therapy research are expected to restrain the demand for therapeutic drugs used in Parkinson’s disease. This report aims to provide insights into the global Parkinson’s disease treatment market. It provides valuable information on the market classification by drug class, distribution channels, and patient care setting. Details on regional markets for these segments have also been presented in this report. In addition, leading players in the market are profiled to understand the strategies undertaken by them to be competitive in this market. Parkinson’s disease treatment is used to treat the symptoms of Parkinson’s disease, generally, medication is the first line treatment for this disease. The global Parkinson’s disease treatment market is expected to reach USD 5.69 billion by 2022 from USD 4.24 billion in 2017, at a CAGR of 6.1%. Rising geriatric population and government funding for research on Parkinson’s disease are the driving factors for this market. The Parkinson’s disease treatment market is segmented on the basis of drug class, distribution channel, patient care setting, and region. On the basis of drug class, the Parkinson’s disease treatment market is segmented into carbidopa/levodopa, dopamine receptor agonists, MAO-inhibitors, COMT-inhibitors, anticholinergics and other drugs. The carbidopa/levodopa segment is expected to account for the largest share of the market in 2017. The growth in this segment is primarily attributed to the potency of the drug. By distribution channel, the Parkinson’s disease treatment market is segmented into hospital pharmacies, retailer pharmacies, and online pharmacies. In 2017, the hospital pharmacies segment accounted for the largest share of the market. Increasing number of patient visits to the hospital due to the availability of diagnostic laboratories and presence of skilled neurologists are driving the growth of hospital pharmacies segment. On the basis of patient care setting, the Parkinson’s disease treatment market is segmented into hospitals and clinics. In 2017, hospitals are expected to account for the largest share of the Parkinson’s disease treatment market. Robust health infrastructure and presence of skilled neurologists are the driving factors for hospital segment. 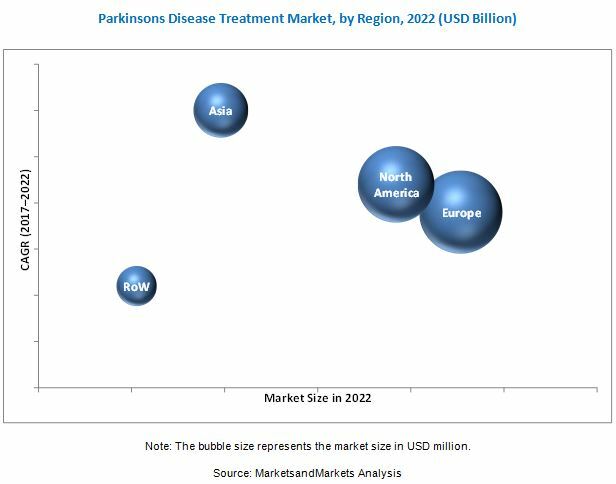 By region, the Parkinson’s disease treatment market is segmented into North America, Europe, Asia, and the Rest of the World (RoW). The market is dominated by Europe, followed by North America, however, the Asian region is expected to witness the highest growth during the forecast period. Asia is expected to witness the highest CAGR, with the growth in this market centered at Japan, China, and India. The increasing number of generic drug manufacturers and rising aging populaion across are key factors driving the Parkinson’s disease treatment market in Asia. However, availability of alternative treatments is going to restrain this market. Hospitals segment is estimated to account for the largest share of the Parkinson’s disease treatment market in 2017. This segment includes large, medium-sized, and small hospitals as well as critical care centers. Growth in this market can largely be attributed to the patient visits to hospitals are very high owing to the availability of diagnostic laboratories for diagnosing diseases; and presence of skilled professionals. Clinics, also known as outpatient clinics or ambulatory care clinics, are healthcare facilities where outpatients are treated. In comparison with hospitals, clinics are expected to hold a smaller share of the overall market in the coming years mainly due to the shortage of neurologists in these facilities. In addition, most clinics do not have in-house diagnostic laboratories, owing to which most patients prefer hospitals. Teva (Israel), AbbVie (US), Boehringer Ingelheim (Germany) Lundbeck (Denmark), Acadia (US), Sun Pharma (India), US WorldMeds (US), Dr. Reddy’s (India), are the top players in this market. These companies have a broad product portfolio with comprehensive features and a strong geographical presence.